Inflatable Boat Or Hard Hull Fiberglass or Aluminum Boat? HomeBoatsToGo - Blog About Inflatable Boats, Inflatable Rafts, Inflatable Kayaks And More...Inflatable Boat Or Hard Hull Boat? Inflatable Boat Or Hard Hull Boat? Whether you're looking to have a blast with friends and family or just relax, there's nothing like being out on the water. And, the great news is that it's never been easier or more affordable than with today's innovations in inflatable boats. For so many, boat ownership can seem like a part-time job and a full-time expense: the varnish, the paint, the dock and mooring fees, towing and storage- the list goes on! With an inflatable boat or inflatable motor boat, many of these chores and expenses have been entirely eliminated, leaving more time (and money) for lots of fun in the sun… and isn’t that really what it’s all about? Whether you’re rowing or motoring around out there, inflatable boats, with their lighter weight, and inherent versatility are easier to store, transport and launch than their hard-hull counterparts. There is no need for a trailer hitch on your SUV, or a roof rack to tow your boat. Rigid-inflatable boats can easily be folded and will take up minimal space in your garage or other storage area. With no dock and mooring fees, the versatility of an inflatable motorboat will save you a great deal of time and money. Inflatable boats and motorboats are incredibly low-maintenance. And, with the latest materials and techniques that go into their manufacturing, rigid-inflatable boats have never been more stable, durable, affordable, or fun! Setting up an inflatable boat has never been easier. Once you reach your destination, you can inflate your boat and start cruising on the water within minutes. Want to have a picnic on the beach? Unlike most hard-hull boats, launching from the beach in an inflatable (and returning) is a breeze. 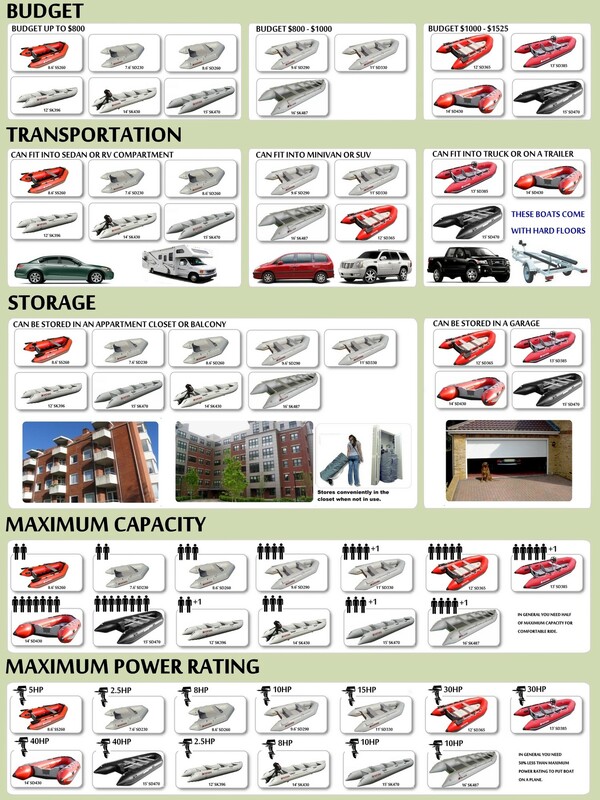 When comparing inflatable boats to hard-hull boats, there isn’t much comparison. If you are looking to save time and money while maximizing the fun, an inflatable boat is the way to go. To learn more about which type of inflatable boat is right for you, visit us at http://BoatstoGo.com or give us a call at 866.299.7740. With so many options available to you with inflatable boats, one thing you can be sure of is that there’s a whole lot of fun just waiting for you on the water!